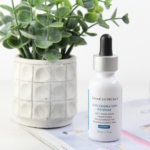 SkinCeuticals Pigment Regulator is a new product for treating hyperpigmentation that has been proven to be as effective as 4% hydroquinone (the gold standard) but without the potential side effects. I’ve been using Pigment Regulator for the past month; read on for my thoughts…. For those with hyperpigmentation, age spots, discolorations from acne, Melasma and sun spots, finding a treatment that is effective and offers a safe alternative to 4% hydroquinone can be a real challenge. In a 12 week clinical trial comparing 4% hydroquinone to SkinCeuticals Pigment Regulator, there was no statistical difference found in the pigment lightening abilities of the two products. That’s pretty impressive. 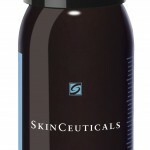 SkinCeuticals Pigment Regulator is a light cream that is applied to affected areas twice daily. The main benefit to using Pigment Regulator is that it’s gentler on your skin; can be used all over the face, not just localized areas and can be used long term–unlike other treatment products where you have to take a break. The formula contains a blend of 2% Emblica, 2% Kojic Acid and 10% exfoliants. This trio of ingredients works in 3 ways to systematically improve uneven skin tone by inactivating tyrosinase (therefore blocking the start of the melanin production process), preventing melanin deposits from reaching the surface and breaking up melanin clusters on surface skin to reduce existing discoloration. In using SkinCeuticals Pigment Regulator twice a day for over a month, I am happy to report I saw definite lightening and improvement in areas of discoloration and hyperpigmentation on my skin. Some areas are nearly gone, one sunspot is much lighter and an area of redness from a scar is nearly gone. I’ve had absolutely no irritation, stinging or reaction from using this product. 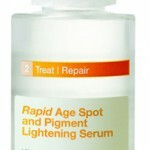 Remember also to apply a sunscreen daily to help to prevent additional hyperpigmentation! 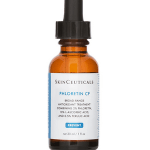 SkinCeuticals Pigment Regulator retails at $85 for 1.0 ounce and is available in physicians’s offices and various online retailers including SkinCeuticals.com and SkinStore.com . I would encourage you to check with your Dermatologist prior to use to see if this type of product is appropriate for your skin condition. Thanks, Nancy I’m always looking for something to get rid of a few sun spots I have. I’ve tried other products but they ususallt involve several steps, but this sounds easy-peasy!